The new school year will begin shortly. Draft tuckshop rotas have been published here (password required) and the Calendar and Coming Events updated. If you are expecting to be on the rota and haven’t had an email, please let me know… email John. As always, with people moving on at the end of the school year, we are in need of a few more volunteers to ensure we can continue to run the tuckshop on a Friday evening and Saturday morning every week. If you would like to join us please contact us via the Tuckshop Volunteer Form. This term’s BCMS Newsletter was issued to members yesterday. It contains details of what’s happening this term and a reminder of practical arrangements. You can also find out what’s happening from our Coming Events page. On Saturday 7th May we are planning on sorting out the stock of music – we have to weed out items that are not usable (e.g. have parts missing) and organise it better. All volunteers to help with this are welcome. While we are at it if anyone would like to buy some of it, we will be taking donations at our pop-up shop. To see some of the items we have, visit our Music and Instruments for sale forum. 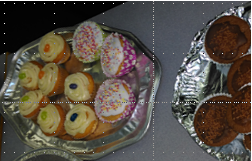 Thanks to all for the donations of lovely cakes and biscuits for the Open Morning. A small sample are shown above. Everything got eaten! And we raised some money from the sale of some music too. Music school will start again on the week commencing 11th April. If you are on the tuckshop rota look out for an email with details soon. If you are not already a volunteer, do come and join in. You can use our online form to sign up. Update: We raised a total of about £110 from the morning, including £24 from sale of music. Thanks to you all for your generosity. The Music School will be holding an Open Morning on Saturday the 12th March. Do invite your friends to come along and see what goes on and hear the rehearsals. Refreshments will be provided in the Library. Don’t forget to bring along cakes or biscuits for the cake stall and any music or musical instruments you would like to sell. Happy New year to you all and welcome to a new term of Music School. A Newsletter was handed out yesterday with useful information about the Music School, but you can also see what’s happening via our Coming Events page. A particular welcome to new KS2 Beginner Ensemble members and their parents/carers. Watch out for more details of our Buns and Biscuits and Music Sale at the Open Morning on Saturday 12th March. If you are around on a Saturday Morning do visit our tuckshop for drinks and other goodies. Our tuckshop volunteers are always happy to chat and try and answer any of your questions. As always, we need to recruit more volunteers to help with tuckshop once a term. If you would be happy to help us out, you can let us now via our Online Volunteering Form. Or come and talk to us at the tuckshop. Well done to the staff and all the performers at yesterday’s concert. Great entertainment! Thank-you to all who contributed mince pies, cakes and biscuits. Thank-you also for the generous donations. We raised a total of £240 for the charity Emergency medical charity Suffolk Accident Rescue Service. Well that’s it for Music School for this term. See you all next year. P.S. Don’t forget to bring your donation of mince pies on Saturday to go with the seasonal refreshments. See our Friends Committee page for news and photo from our Annual General Meeting. Welcome to our new committee members Alan Field, Julie Culpin, Karen Grant and Tom Culpin.